Launching an eCommerce store is only the start of the battle for many of your clients. While getting a store up and running is key for many clients, taking a store from launch to repeat sales is an area many merchants need help with. In this session, we’ll cover both strategies for taking a store from idea to launch, as well as a few ways you can continue to deliver value to clients after launch. Each of our sessions are digitally broadcast live and feature world-class speakers. Each presentation typically has 30-40 minutes set aside for instruction followed by another 15 minutes or so for Questions & Answers at the end. This session is all about eCommerce, and it’s coming from one of the most experienced persons in the space! Beka has many years of experience behind her running SkyVerge, Jilt, and SellWithWP, not to mention all of the other conference presentations and webinars that she’s delivered. Throughout this presentation, you’re going to learn all of the bits you need to know both to get an eCommerce shop up and running as well as the important areas where you should focus attention to land sales and long-term growth for the business. 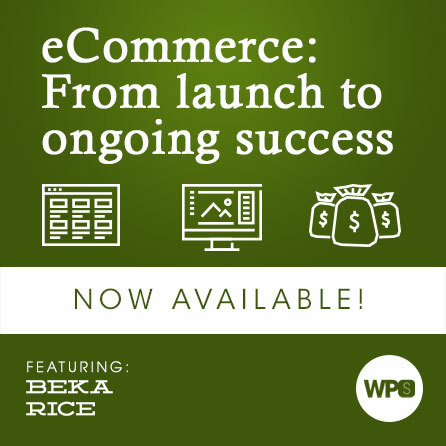 In particular, Beka will teach you about several aspects of how eCommerce itself works (not only the fundamentals, but things like catering to proper user experience, too). She will also teach you how to gather and leverage analytical data, create effective marketing plans, and which areas to focus on to deliver the most value both during and after launch. Make some time for this session because it will give you a serious advantage to creating, selling, or operating ecommerce sites! Which areas deliver the most value at launch? Which areas deliver the most value after launch? Beka Rice is the Head of Product at Jilt, where they focus on helping merchants increase revenue through automated lifecycle emails. Jilt’s goal is to level the playing field for eCommerce growth by taking enterprise-level tools and strategies, and making them available to any merchant. Jilt is built by SkyVerge, the top WooCommerce.com extension provider, and maker behind some of the most popular extensions, such as WooCommerce Memberships. When she’s not keyboard-punching, Beka enjoys hiking, reading, and playing music.